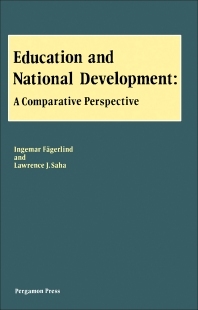 Education and National Development: A Comparative Perspective discusses the correlation between education and national development. The book is comprised of nine chapters that cover several concerns regarding the subject matter, such as the theoretical underpinning, dimensions, policies, and practice. The first chapter discusses the origins of modern development thought, while the second chapter talks about how formal schooling can serve as an ""agent of change"". Chapters 3, 4, and 5 cover the various dimension development, which are economic growth, employment, quality of life, and political system. Chapter 6 discusses strategies for educational reform, while Chapter 7 deals with the evaluation of development policy. The eighth chapter provides a comparative discourse about education and development under capitalism and socialism. Chapter 9 talks about education, the state, and development. The book will be of great interest to readers concerned about how education correlates with national development.